Everything Everything – Book Review! After hearing so much about this book, I had to find out what all the fuss was about. I also knew that once I finished this book, it would open up the possibility of watching the movie adaption. 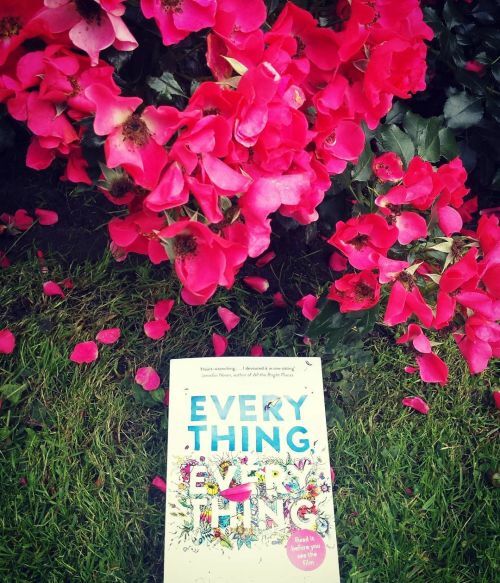 Everything Everything was a book I thoroughly enjoyed! Here is my review for this lovely novel. Madeline, a 17-year-old teenager has only loved one way. Alone with the only company being with her mother and nurse Carla inside her white clean house. At least nothing in here will kill her. If Maddy was to venture outside, she would die. This is due to an incredibly rare disease that she has – she is allergic to the world. She deals with this by reading incredibly clean books and playing games with her mother. However, a truck arrives one day with new neighbors. Usually Maddy would not care about hings happening outside her home, but someone catches her eye. A boy who is tall, lean and looks like the angel of death dressed in black. This was someone who Maddy had a feeling she may potentially fall in love with, and it would be a disaster for her bubble. But this boy lives on the outside of Madeline’s world. A completely different realm of existence. She eventually finds out his name, Olly. Maddy also finds out that his bedroom is opposite her own, allowing her to notice things he does. Olly soon makes contact with Maddy through a note and it opens up a new world for her through I.Ms. Will Maddy be able to survive the fact that her life is potentially in danger of contamination? After everything her mother and Carla have done to keep her safe, will Olly be the breaking point of her illness? Or will Maddy realize that there is more to life than just living in a bubble? When I first heard about Everything Everything, I was incredibly excited. I loved the concept of a girl who needed to live inside a bubble and how she starts falling for someone who lives outside of this bubble. At the beginning of the novel, the character introductions were great, especially for Maddy. Her character felt incredibly sheltered because of her disease and I felt really sorry that this was her life. But despite her rare condition, she was able to live her life with her mother and her nurse Carla. When Olly was introduced, it did start to feel slightly “cliché” in terms of “boy next door” scenarios, but I thoroughly enjoyed it. The growth of Olly and Madeline’s relationship was beautifully written by Yoon. How Olly was incredibly careful when it came to Maddy’s well-being and making sure she was always safe. It was an incredibly heart warming novel about love against all odds. One thing that I enjoyed feeling from Everything Everything was the vibes I received from various other books/movies. The first being from The Fault in Our Stars by John Green. The two main characters of Everything Everything reminded me so much of the characters from The Fault in Our Stars. Throughout the book, I grew to think of Olly as Augustus Waters with the same quirky traits and disregard for Maddy’s illness, the same way that Augustus felt for Hazel. Maddy also reminded me of Hazel, how she knew she had an illness and she just had to deal with it. She was also willing to take risks! Everything Everything also made me think of the Disney movie Tangled. Maddy was stuck in one place with her mother, and Rapunzel was the same. Even though Rapunzel could leave whenever she wanted, she was forbidden to do so by her mother. There were other similarities for me, but I will not say due to potential spoilers! Another aspect of Everything Everything that I thought was incredible to the story telling were the illustrations. Different artwork pieces of diaries, I.M. messages between herself and Olly, to various different drawings from Maddy. These illustrations really enhanced the reading experience for me and helped me grow more attached to Maddy as a character. Seriously a great addition to the novel. Overall I really did enjoy reading Everything Everything. Each of the characters were superbly written and really in-depth. The story progression was incredibly gripping and I loved the different twists and turns that the narrative took you through. I constantly kept thinking one thing, then reading another and MY GOD it was intense. There were moments while reading that I did not want to book the book down, cause I needed to know what happened next. Definitely a page turner to sink time into. The ending of the novel was incredibly beautiful and super open. What I am really looking forward to now is checking out the movie adaptation for Everything Everything. I knew going into this book that there was a movie out, but I refused to watch it. I did not even want to watch the trailer! If I was to watch the trailer beforehand, it would more than likely ruin my immersion to imagine what the characters would look like. I will report back once I have watched the movie! Everything Everything was seriously worth a read, and I am so happy I can now add it to my “read” list. Would really recommend this book to anyone who enjoys YA romance novels that are very reminiscent of The Fault in Our Stars. Everything Everything by Nicola Yoon, a book about a bubble girl falling in love despite the world fighting against her, gets 4 out of 5 flails! Next Next post: Amy & Roger’s Epic Detour – Book Review!